The other I was walking and apparently quite hungry because I thought up a recipe I couldn’t wait to try out. Yesterday I was able to start it, but since I haven’t been to the grocery for a few days I am somewhat hampered by what I have on hand. 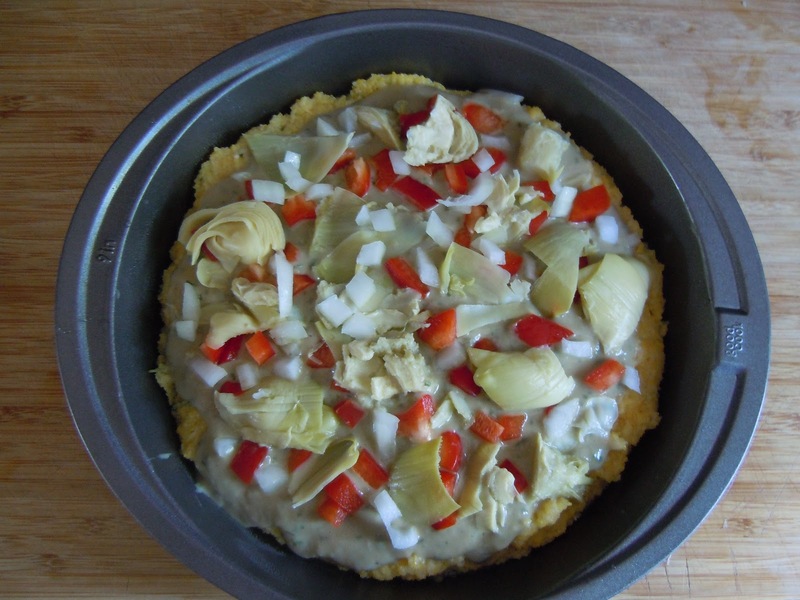 What I did have on hand was Bob’s Red Mill corn grits which I made into rosemary infused polenta, with cannellini bean and garlic sauce/paste and some veggies on top. 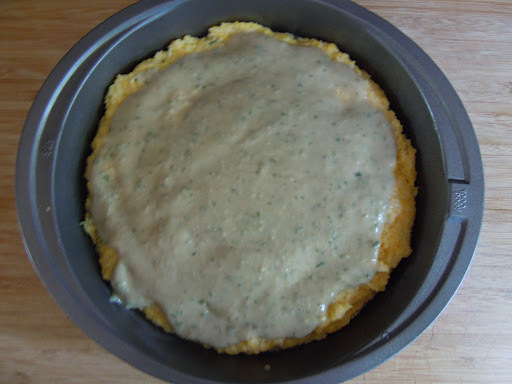 The polenta was easy~ I followed a mixture of directions and added rosemary (minced, and from my front yard) while it was cooking on the stove top. It was only about a T and I should have added more rosemary and/or some other herbs to the 2C water/1 C cornmeal because it was blander than I like. I didn’t add butter like a lot of the recipes recommend, which might have added a bit more taste also, so perhaps next time. I then sauteed in a pan olive oil, onions, rosemary, garlic and at the last couple of minutes, a can of cannellini beans including about half the water that was in the can. This all went directly into the food processor to make a thick sauce, to which I added about a cup of basil leaves from my back yard. I actually wanted to make a full on pesto to add a layer to this dish, but I didn’t have enough basil so did it this way instead. I cooked it in the oven at 350 for about 20 minutes, and then broiled it for another 10 to get the top browned a little. It was a good hearty dish, especially served on a bed of spinach, but next time I will add a lot more herbs because it lacked flavor. The real reason I’m posting about it is that you can do this kind of thing with just about any sauce, bean, and/or veggie available and it is a great gluten free dish. I suppose you could add meat too if you wanted. Next time I will do either pesto or red sauce and add the whole beans on top with the veggies. Or I might do a refried bean version and some Mexican cheeses. The options are endless~ just be sure to have plenty of herbs on hand to make the polenta really shine and not just a carrier for the other ingredients. Previous Post "A Little Nothing"